M.A.D. stands for Making A Difference; Positively M.A.D. shows how. This uplifting collection promoting organizational activism addresses the disenchantment felt by many who work in large organizations. 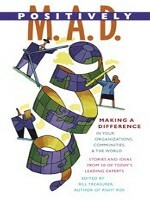 Featuring "can do" vignettes by more than 50 renowned writers such as Beverly Kaye, Chip Bell, Richard Lieder, and Jamie Walters, the collection recounts "mad" stories about people and actions that transcend the ordinary. With workplace surveys consistently reflecting high levels of job dissatisfaction, it makes a lot of sense to explore opportunities that individuals have for increasing their own level of satisfaction.